The saga over the Escondido Country Club is moving toward a close. 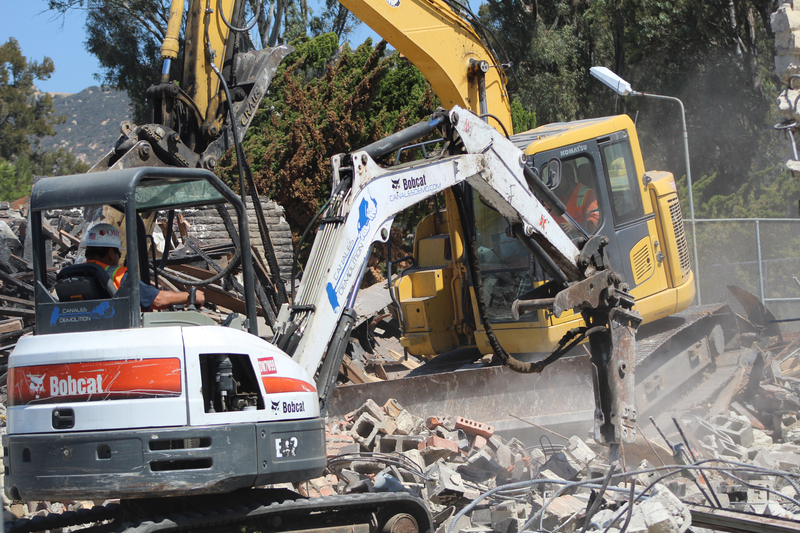 On April 26, New Urban West Inc. began demolition of the club in preparation for its impending residential development. NUWI said it received permission from property owner Michael Schlesinger to raze the dilapidated building, which was destroyed in a November 2017 fire. Last fall, the Escondido City Council approved NUWI’s plan to develop the property with 380 units, a $10 million clubhouse with a restaurant, bar, pool and banquet facilities, and a 29-mile greenbelt. In all, 44 percent of the property will be preserved as open space. The clubhouse, along with the adjoining golf course, was closed in 2013 due to poor financial performance. A long battle over the property and Schlesinger and its development has been a source of contention with some residents. Several years ago, a group of residents formed the Escondido Country Club Homeowners to fight against several plans to redevelop the area. However, one more hurdle remains as Escondido Country Club Homeowners filed a lawsuit after the council’s vote. Media reports speculate the suit may not have merit after the group’s board resigned and a new board was installed. The case is scheduled to be heard May 4 in the Vista Superior Court. According to Escondido Country Club Homeowners’ website, though, the issue over the former board and its tax returns has been rectified and the group’s legal status has been restored. This building must have asbestos since it was built in the 60s – shouldn’t those workers have face-masks or ventilators on? Shouldn’t Michael Schlesinger or New Urban West be responsible for the workers protection? Or is it just all about the bottom line? ECCHO 5 are pond scum. Lock me up! Why are you important, or just think you are?